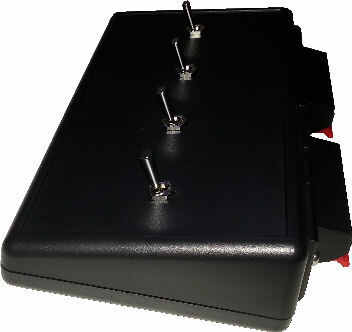 Custom a switch box tester to do testing or quality assurance for your production. A proper design tester box can help simplify the operating procedure, reduce human error and improve the business services and products quality. 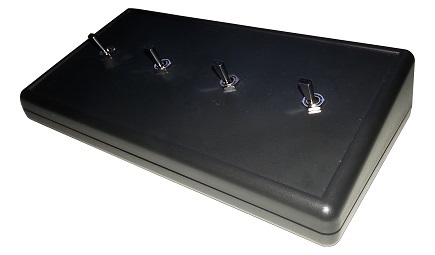 Contact PIC-CONTROL for a customise test switch box from a standard enclosure for electronics. Quick connect and release connector is at the back of this test switch box. These connectors are typically used as audio speakers connector. Suitable for small and high power electronics. To connect wires, a user just holds the lever, insert the test wire and release the clip. The wire will be secured, and testing can proceed immediately. It is useful for situation where cases connection is very frequent or temporary. This is an example of a very simple switch box wiring. For a more complex project which requires electronics control and interface, a PCB (printed circuit board) can be design and housed in a standard enclosure. Check out our standard custom electronic enclosure page for more examples of a custom tester box solution. Send us more information on your box up requirement. 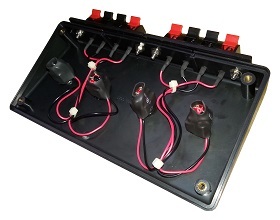 Check out our custom standard enclosure solution for your electronic. Also check out our custom cable tester design for your wire harness assembly checking and the PCB Tester Fixture Jig Design for your production parts checking.